Author(s) Warner, Carolyn M.; Kılınç, Ramazan; Hale, Christopher W.; Cohen, Adam B. 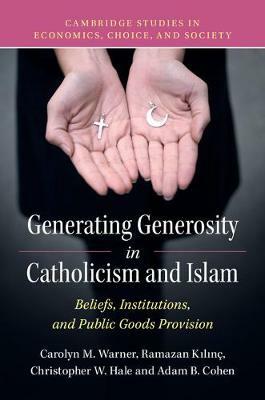 Using an innovative methodological approach combining field experiments, case studies, and statistical analyzes, this book explores how the religious beliefs and institutions of Catholics and Muslims prompt them to be generous with their time and resources. Drawing upon research involving more than 1,000 Catholics and Muslims in France, Ireland, Italy, and Turkey, the authors examine Catholicism and Islam in majority and minority contexts, discerning the specific factors that lead adherents to help others and contribute to social welfare projects. Based on theories from political science, economics, religious studies and social psychology, this approach uncovers the causal connections between religious community dynamics, religious beliefs and institutions, and socio-political contexts in promoting or hindering the generosity of Muslims and Catholics. The study also provides insight into what different religious beliefs mean to Muslims and Catholics, and how they understand those concepts.